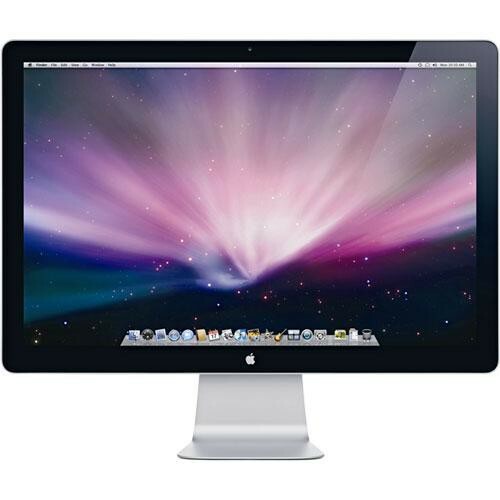 The Apple LED Cinema Display features a 24 Inch glossy LED-backlit LCD display with a resolution of 1920x1200, a built-in iSight camera with a microphone for use with iChat and Facetime etc. Plus a built in 2.1 speaker system, (Stereo speakers with a subwoofer. ), for playing your favorite music, movies or games. It has three USB 2.0 ports on the rear for connectivity and connects to an Apple laptop or desktop via a hard wired 40 Inch single cable that has three connectors. Mini Display for video, USB 2.0 for connectivity and MagSafe for charging if used with an Apple laptop. Although the Apple 24 Inch LED Display was designed to complement the MacBook, MacBook Pro, and MacBook Air models with a Mini DisplayPort, it is also fully compatible with Mac Pro desktop machines that have a Mini DisplayPort on the graphics card, (Standard from 2009 models.). For use as a second display with any iMac Mid-2009 and onward. And for use with any Mac Mini Mid-2010 and onward. NB Thunderbolt is backwards compatible with Mini DisplayPort. Please note if you are purchasing this display for use with a Mac Pro that is not placed on your desktop you will likely need standard extension cables for Mini Display and USB as the cable and connectors are a total of 40 inches long from the lower rear of the display. The Apple LED Cinema Display is compatible with any Apple computer with a Mini DisplayPort. It was released on October 14th 2008 and discontinued on July 27th 2010. This used Apple 24 Inch LED display is in great condition with a couple minor marks on the outer case from previous use. The screen is clear and bright and has no imperfections. It comes complete and ready for use with all cables and power cord. If you have questions please Contact Us or for general information see the Help & Info page.